@IYellObviousThings1, Also we helped to fund it so technically we not only owned Japan with the bombs but we own a portion of the refounded city. @Sortofslobro, It wasn't- it was specifically founded by the Portuguese to encourage trade. Then they kicked the Portuguese out. 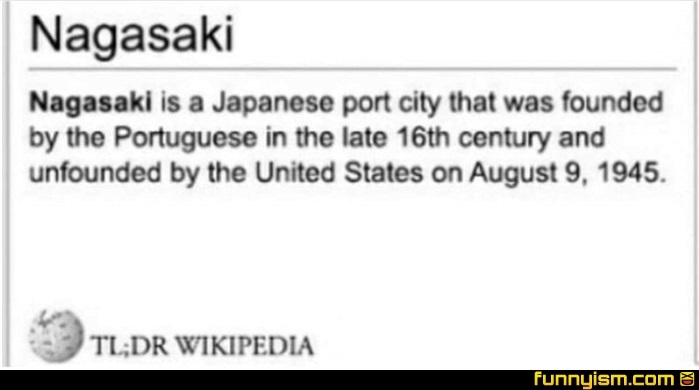 Nagasaki and Hiroshima get all the attention because they got nuked. Other cities were destroyed, we fire bombed several other cities that almost entirely burned to to the ground because every building was wood thatch. @benderama, I actually disagree. If we judge right and wrong simply by how many lives were spent I’d argue the nukes saved many lives. The fact it took two nukes to force a surrender tells me it would have become a drawn out land battle with many more lives at risk. It’s not fair civilians had to pay for it but that’s the fault of the leadership. @benderama, why do you exist? @benderama, lol. You couldn’t if you were a lot better at this than you are. You’re a weak minded, obviously insecure, sad little creature. I feel bad for you, I have a feeling you’ve been abused and come here for a release. I’m fine with it as long as you don’t lash out at kids like you are probably not far from doing. @benderama, it’s not that hard to figure out. @benderama, if you say so. Please seek help before harming others. @benderama, “I strive for world peace, but get my rocks off trolling on the internet being mean to people”. Makes complete sense. Your twisted mind may even seem rational to you. It’s sad how obvious it is to the rest of us tho. @benderama, oh my god. Damn I’m really sorry. I would have guessed by your mental ability and writing skills that you’re a medium IQ 7 year old. I’m really sorry, I didn’t mean to pick on you. I didn’t think you were actually handicapped. My sincere apologies. @big freedom, ¿por qué estás tan herido por mis bromas?